A few weeks ago, I was walking through a wood in the English countryside when I heard the unmistakable call of the cuckoo. For some reason, it caused me to fall into a reverie, and as I walked, I began to meditate on that iconic bird and what it represents. The European cuckoo (Cuculus canorus) is, famously, a “brood parasite”: the female lays her eggs in other birds’ nests. Typical victims are small birds like reed warblers and wagtails. When the young cuckoo hatches, its first act is to dispose of any other eggs: it heaves them out of the nest, leaving itself as the sole occupant. What happens next is peculiar. The foster parents don’t appear to notice they are rearing a monster. Instead, they work hard to satisfy the demands of the chick, even though it sometimes becomes so large that it no longer fits inside the nest, and has to sit on top. It’s one of the oddest sights in nature. The cuckoo habit has evolved several times. It’s found in species as diverse as cowbirds, indigobirds, honeyguides and even a species of South American duck. Among professional brood parasites, different species have different levels of destructiveness. The duck, for example, is rather charming: it doesn’t destroy any eggs nor enslave its foster parents. All it needs is a bit of warmth for the egg to incubate. The day the duckling hatches, it paddles off into the world, fending for itself right from the get-go. It’s one of the planet’s most independent young birds. A honeyguide chick, in contrast, is one of the most vicious. It hatches with special hooks on its beak; it uses these to destroy any eggs, or kill any nestlings, that it finds in the nest. (The hooks disappear when the chick is about 14 days old.) Meanwhile, parasitic cowbird chicks don’t usually attack the other chicks in the nest, but they do compete with them for food. One reason such birds are interesting is that they allow us to watch evolution in action. In general, the stronger the threat from the cuckoo (or honeyguide or whatever), the stronger the selection on the hosts to spot intruders — and the stronger the pressure on the cuckoo to evolve to be undetectable. Which is why the eggs of these birds often bear a close resemblance to the eggs of those they victimize. Among European cuckoos, for example, individual females specialize on particular species — so the egg of a cuckoo that preys on great reed warblers looks different from the egg of a cuckoo that preys on redstarts, which in turn looks different from the egg of a wagtail-specialist. Yet each egg looks remarkably like the host egg, down to the color of the shell and the pattern of any splotches. The resemblance is particularly strong in species where the host is prone to rejecting cuckoo eggs. Assessing the degree of egg resemblance is tricky, for birds don’t see the world as we do: they see more colors. Therefore, what looks like a good match to us may not look like a good match to the bird; and vice versa. Fortunately, it’s now possible to measure egg colors and patterns with machines, not humans — and such measurements do, by and large, show that there really is a good match. This raises a question. If cuckoo eggs evolve to look so similar — why don’t the chicks? Especially as, in species of brood parasite like the indigobirds, the young look much more like the “real” chicks. The obvious answer is sinister. 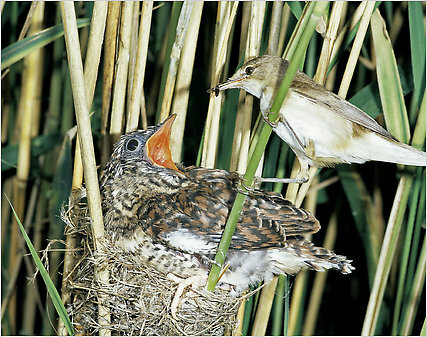 As far as birds like reed warblers are concerned, it may be that cuckoo chicks do resemble their own offspring. That is, the cuckoo taps into the hosts’ sensory world: it has a brightly colored open mouth, and it sounds like an entire brood of extremely hungry warbler chicks. (To compensate for the fact that there’s only one mouth, not the usual four, the cuckoo begs much more noisily than reed warbler chicks would.) Apparently, this is enough to stimulate the little birds to care for it. Which makes me wonder: what are we missing? Like the birds — like any organism — our sensory system defines the way we perceive and interact with the world, and it is limited in important ways. As I said earlier, our sense of color is not as vivid as that of most birds. As mammals go, our sense of smell is poor. We hear a limited range of sounds: unaided, we cannot hear much of the conversations of elephants, or of bats. And in a more metaphorical way, the sight of the cuckoo chick makes me wonder what we miss by our routine habits of thought. To what extent do our preconceived notions narrow our perception of the planet, and ourselves?